Skirmishes can be a lot of fun! True, I was older by the time I ever experienced my first skirmish. 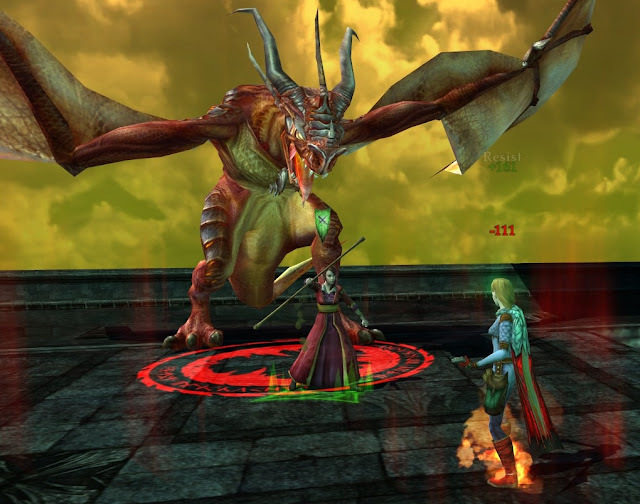 But, when I got there, I enjoyed this part of the game as much as I did while questing… just different. The first thing I needed to learn was what a soldier was, what I wanted from a soldier, how do I develop a soldier, etc. I started off with the soldier I was assigned by the Skirmish Captain. It was some man warrior guy. I barely remember him; I think his name was Stud. I tried to recall the story to Danaszar and she sent this shot of her going out with her inept level 1 Soldier. He improved to a level 1 Warrior after their first skirmish, but he isn’t much about which to get excited. So, there I was at level 65, with my basic warrior and did not know beans about anything until Menelchol taught me about the Skirmish Captain and the Skirmish Trainer. Until then, I had skirmished a half dozen times at Amon Sul. My warrior was always running off getting into trouble and was quick to die (he was, after all, a level 1 warrior with no skills in a level 65 skirmish since I had not figured out how to train him). First thing, the Trainer allows you to train up your skills, and the Captain lets you slot those skills. You need to visit both to get your soldier to be productive. Good to know. 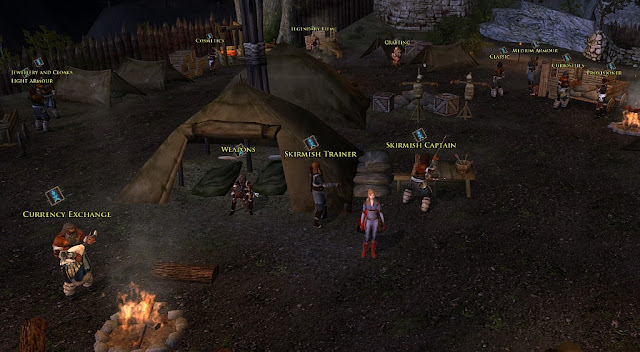 J Here is a picture of the skirmish camp in Galtrev; the other camps should all have people covering these jobs in each camp. · Protector – aggros, like a Guardian. After reading about all of the soldiers, I chose the Herbalist. I am sure the others are all nice in their own ways, but Herbalist fits me best. When I play solo, I unleash the Fury and Wrath and am looking to cause the most devastation possible as fast as possible. I do still move and kite some and work to sharpen my skills, but the Herbalist lets me unload the damage with no recourse of needing to worry about my morale bar. Think about that; I am a light armor wearer and am never concerned about getting hit since the Herbalist always has my back. Healing is her job; it is all she does. She heals me, she heals herself, she heals our allies. She never attacks. She never runs off in the wrong direction. She just stands there, sometimes in the middle of the fray if necessary, and heals. Bold. Powerful. Awesome. I did have to train her though. Once you know about the Trainer and Captain, it isn’t too bad and it isn’t that expensive. The previous post (best-295-tp-ever) gave some insight into soldier training cost. By the time you get the hang of skirmishing, marks wil be rolling in and leveling the soldier feels really cheap. Here is what I chose for my Herbalist traits (That which I was taught, I pass on to anyone who wants to know). Skills: The Herbalist is skilled to heal me and all allies with the skills: Herbs of Boundless Endurance, Nature’s Cure, Refreshing Herbs, and Ultimate: Words of Healing. Training: She is trained to heal better (more tactical mastery), have more morale and power, and never run out of power (ICPR) with the training: Boundless Morale, Boundless Resolve, Tactical Potency, and Resurgent Power. Personal: I don’t just “feel” better by having a wonderful Herbalist, I AM better. 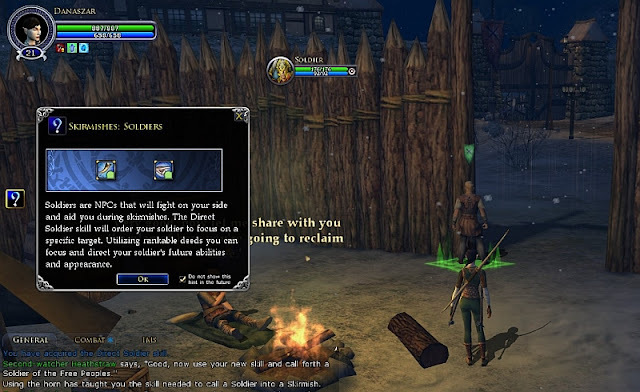 The personal trait section is for boosts to the player because “You are more powerful while leading a Soldier in Skirmishes”. I chose Battle-master, Defender’s Bane, and Tactical Artistry. All three improve my ability to unleash Fury and Wrath, which is something I really enjoy while skirmishing. 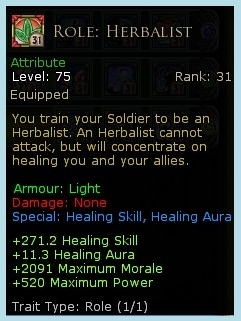 Please do feel free to copy the skill choices of this Herbalist. I have nearly never lost a Skirmish with her (only Icy Crevasse a few times early on) and we always have a good time! Hello! I used to have bookmarked a great blog you made with all style of soldiers and how to choose their skills, but i dont find it anymore : did you delete it ? Hello Moranae! Thanks for tuning in! The post you are referencing was written by the great lore-master Menelchol. After studying under the guidance of the master, I was convinced of the blessed perfection of the Herbalist and never looked back. Though Menelchol is retired and the post you are looking for has been shelved in the ancient archives, perhaps we can convince him to join me for a "guest blog" post or something to record his wisdom for posterity. Stay tuned; it might take a bit as he is on an extended leave of absence. Alas, the guide to which you are refering was one of the lost orphans of a tragic story of the death of a legend site. It had fencing, fighting, torture, poison, true love, hate, revenge, giants, hunters, bad men, good men, beautifulest ladies, snakes, spiders, beasts of all natures and descriptions, pain, death, brave men, coward men, strongest men, chases, escapes, lies, truths, passion, miracles. To be fair though, the guide that led you on this journey was never actually deleted, it was just caught up in the final explosion. Travel well! I have been finally training my Herbalist and... she is becoming increasingly awesome. I used to die all the time, as well as my Herbalist (because I was a n00b and conservative about spending skirm points for some reason). Now, I don't die! It's awesome! I feel like I am writing some sort of testimonial, but seriously Herbalists are awesome. Thanks so much and thanks so much!